I always promised I would come back to this. That I would finish Vespa Vagabond. Well, I'm here. I am back! Late last night, when I dug out my notes and journals from the ride, two loose sheets of paper fell out of one of my journals. Columns of numbers scribbled in smudged pencil. A tally of my expenses from the ride. If you read Honey Rock Dawn - this post in particular - you've glimpsed my obscene compulsion to organize data. When the ride was over (I don't remember doing this, but the handwriting is most certainly mine, as is the motive) I tallied up my receipts. In categories. With my gas receipts, I made note of the date, the city and state, the cost per gallon at that particular station, the amount of gallons (or fractions thereof) purchased, and the dollar total. 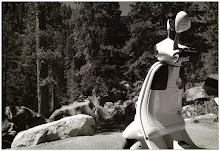 My remarkable little Vespa used just 46 gallons of gas to cross the continent. I'm so glad I make (and keep) these obsessive charts; I never would have remembered these details otherwise! 46 gallons ? I am gonna kill myself ! What a journey, I am amazed ! Once you do that, nothing I believe, could phase you. Good training . Time past so fast....has it been that long ago already ? OT :We want to see Sir Baby's child ? Will Monsieur Ricardo approve of the new guy ? Welcome back! I'm one of those who occasionally check Vespa Vagabond, just in case. But I found the new post through Honey Rock Dawn. You're right. You are a nerd. Welcome back! So cool to see the breakdown of the cost. Wonder how much it would cost in a Smart car? Anyway, it's great to see you posting again. My little Honda gets good gas miles, but crossing the country with just 46 gallons? WOW! It would be interesting to take an anniversary ride across the country and again and compare gas prices with the then and now. Of course, upstate New York is quite similar to 2005... maybe a little bit more depending where you are. Can't wait to read more on this blog - it's one of my favorites! What did you do with the Vespa? Sold it and bought a horse? I'm half-way through a two month solo roadtrip that you helped inspire me to take! I have been keeping all of my receipts and now I know for certain I need to take the time to log all of them for later. Thank you for inspiring us to be stronger and more independant women! So excited to see a new update on this blog! Looking forward to hearing about the rest of your trip. 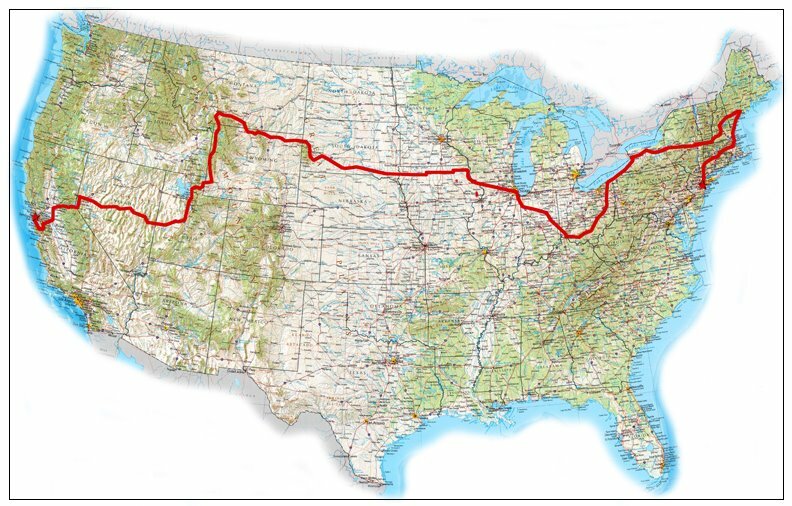 My boyfriend and I are planning a big motorcycle trip this summer traveling through nine states so this is getting me revved up for that! I am very happy to see you revive this blog! I thoroughly enjoyed reading it back when I first found the Daily Coyote. I look forward to new posts! Oh Noooo, I didn't realize you had this blog too Shreve. I am going to have absolutely no life now as I'll be consumed by all three blogs. There are only three I hope. Since the temperature outside is -28 it will give me something to do catching up on all these posts. I'm delighted you've returned to finish this, thanks. Could not wait for more Vespa adventures. You know your die hard fans would love a book about that trip,one day. Can't wait to see your new baby. Do you help deliver the calfs? Shreve, thanks for inspiring me everyday..also love your grandma's blog. She is amazing! Glad you are picking this up again. I guess I'm one of the ones who have been waiting. I think I found Daily Coyote through this blog. Whoa- so amazing that 2 months of travel expenses were under $1000! Would love to hear the priceless details of the trip. How fast do Vespas go? Did you ever have any huge trucks breathing down your back? Or was this ever a problem? Your blogs are the only ones I've ever followed because they are so dang interesting-- thanks for another. YAY!! I'm so glad to see you back. I adore your blogs. Checked in on your blog after hearing Armie Hammer is doing a reality TV show traveling across country on a Vespa. I don't know if you are ready for questions yet about this trip but I was wondering how you planned your route. Did you avoid interstates in preference for regular roads? Only 46 gallons! I think I need a vespa. I want you to know, YOU are the reason I went out and bought a scooter! I've had it 2 years now and I don't regret it! Your numbers are proof! forget the amazing gas mileage...how did you average less than 5 bucks a night on lodging??? Fabulous! So glad to have you back over here... interesting tallies, for sure! :) Can't wait to hear more about your trip. I heartily recommend a "big" Vespa (GT/GTS/GTV) for long-distance touring. I got mine in 2008, and it's been on a number of long trips—Seattle - Portland (a bunch of times), Seattle - Bellingham, Wash., Seattle - Vancouver, B.C., Portland, Oregon - Spokane, Wash. It's plenty fast enough to do the speed limit on any freeway (I don't much like being near big trucks, however), and I get 75 mpg no matter how fast I go. One of Givi's larger top cases would be better than the Vespa-brand item, because they're more versatile, and easily removed. the best pic with Vespa riders EVER! This article is very inspiring to me as a longtime cross country trip dreamer and new Chinese 50cc scooter owner. From what little I know you chose one of the best brands in a Vespa. Thank you for sharing your amazing journey and I hope to one day take a trip even 1/4 as awesome as that on my scoot!